RW&CO. was one of my go-to shopping destinations when I was in university and shortly after I graduated. At the time, it couldn't be beat for blazers and embellished skirts, and for affordable but quality basics like their nearly indestructible layering camis. (I still have a white one from 6 or 7 years ago. Really.) My tastes changed though, and while RW&CO. 's colour palette and aesthetic remained muted and restrained, I found myself straying to other stores for trendier, brighter pieces. Some Instagram snaps from my head-to-toe RW&CO. shopping experience. For more photos, check out my Facebook page. I had a hard time narrowing down the clothes I wanted, but there was one shoe in RW&CO. 's spring/summer footwear collection that stole my heart: these blue suede ankle strap beauties. With its well-placed ankle strap, contrasting suede and patent textures, and skinny heel, this shoe looks like it'd be right at home on a street style blog. Stylish, made of leather, comfortable, and very well-priced at $90. In the end, I decided to build the rest of my RW&CO. outfit around them, selecting a pair of red cropped trousers (love the fit! ), a 3/4-sleeve white blazer (such a versatile staple), and a loose-knit beige sweater (a springtime essential and great for chillier days). 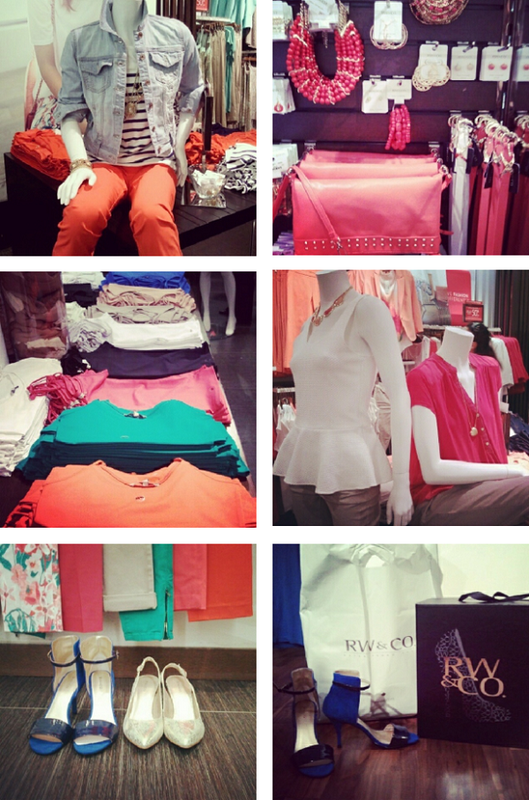 Experience some of the RW&CO. magic yourself with their Facebook contest. 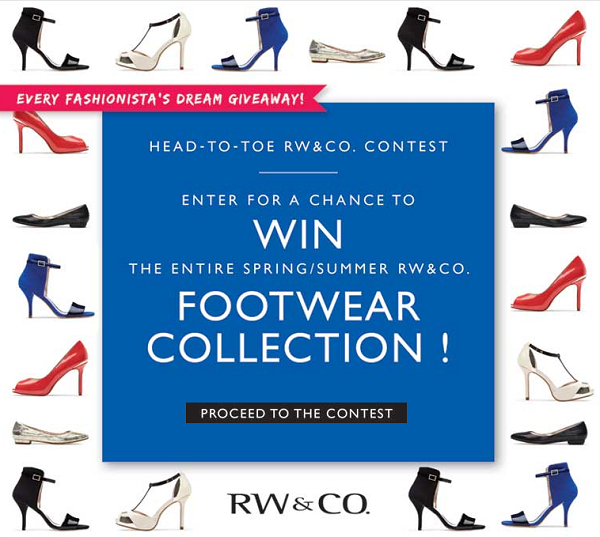 One lucky fashion lover will win the entire RW&CO. spring/summer 2013 footwear collection. That's a lot of shoes to take you from the office to the evening in style. Click here to enter, and good luck! Major thanks to RW&CO. for the incredible head-to-toe shopping experience! For more photos from the shopping trip, check out my Facebook page. So cute! I love the entire outfit... I totally need some lipstick red pants now! Thanks! I think I'm going to be getting a lot of wear out of these pants. I have to start to really dress up for work at my new job so I might just go and check out RW&CO. I really like their jackets this season: great fit, well-priced, and they can dress up anything (plus they ward off AC-induced chills well! ).